Is your dog licking the carpet? There are times where a dog will act… um… strange, to say the least. They’ll do something odd, and you’ll have no idea why. Carpet licking is one such example. Their tongue will work overtime as they continues to lick. And lick, and lick, and lick. And while you might chalk this up to one of their odd quirks, in some instances, this type of behavior can be a sign that something is wrong. Dogs may have something called excessive licking of surfaces, or ELS, where they lick not only the carpet, but also any other type of flooring as well. Some dogs with ELS will even lick your furniture, walls, or any other surface in your home they can get to. They might even compulsively lick their paws over and over again (which is actually a separate condition called acral lick dermatitis). Some pet owners will try to ignore this licking behavior, which is understandable. It’s just licking, after all, how much harm could it do? 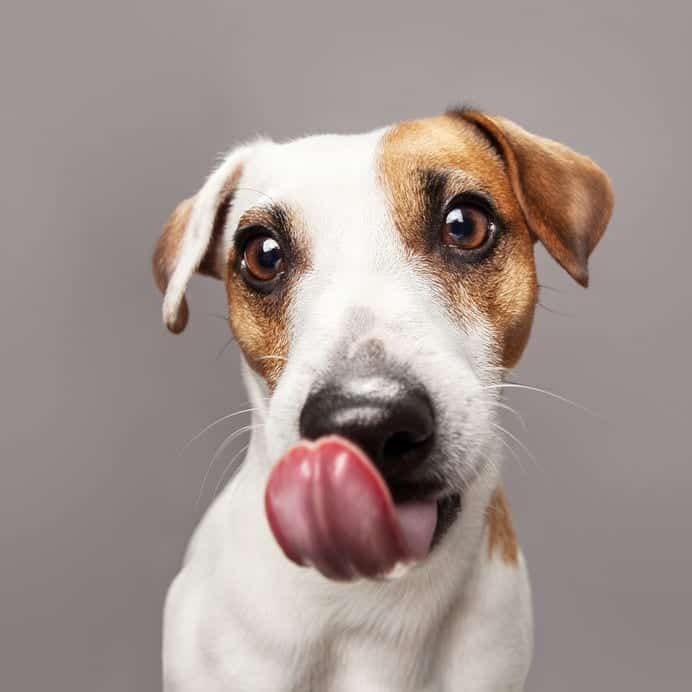 Unfortunately, if done often enough, licking of the floor, walls, and other surfaces can cause some intestinal issues; before those issues arise, excessive licking could also be an indicator that something is already wrong. To clarify, ELS isn’t just an isolated instance; it’s a pattern of obsessive behavior. If your pup licks themselves here and there, that’s considered normal grooming. Repetitive, obsessive behavior is different and could be a sign of underlying health problems. It might even cause health problems, such as an intestinal blockage. For instance, if dogs consume something they shouldn’t, it can lead to a potentially dangerous obstruction in their intestines.1 Dog licking carpet fibers is one such cause for obstruction. 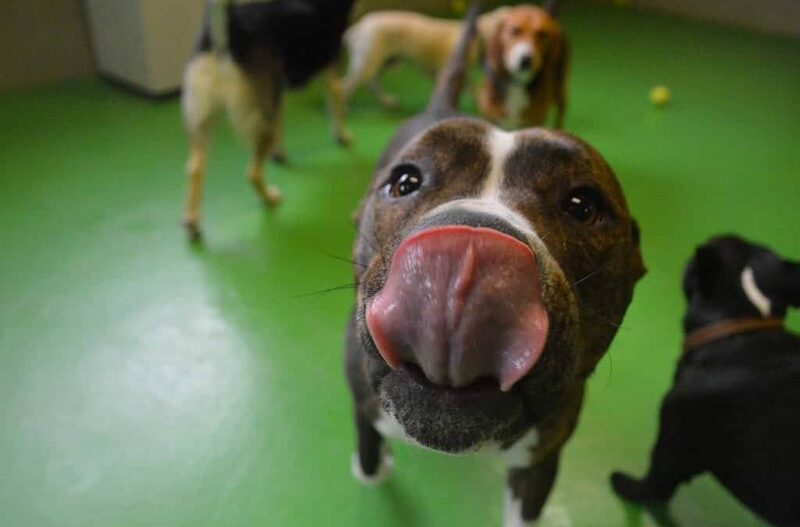 In a study at University of Montréal Veterinary Teaching Hospital, researchers looked into this excessive licking dogs do, and came up with some troubling results. 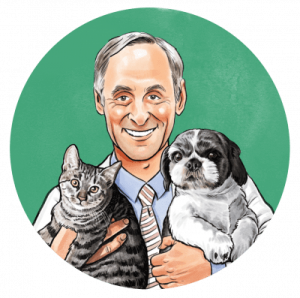 A total of 29 dogs were studied – 10 of them were healthy, and 19 had ELS. According to the results, 14 of the 19 dogs with ELS had some sort of gastrointestinal problem. Some had irritable bowel syndrome, while others had issues such as parasites, and even pancreatitis. So, if you’ve noticed that your dog licking carpet areas or other surfaces repeatedly, take them to the vet’s office to see if there’s an un-diagnosed stomach issue. In some cases, a dog will lick obsessively simply because they’re bored. Some dogs chew up shoes and furniture, and you’ll find some dogs licking carpet or other areas. A few reasons why your dog might be bored include lack of physical or mental stimulation. High energy dogs need to be exercised daily, or at least have toys that keep them engaged and focused. If you think boredom might be the reason they’re exhibiting obsessive licking behavior, there are some things you can do to try and fix the problem.3 First, make sure your dog gets plenty of exercise. Get them off the floor and onto their paws. Take your pooch on a walk around the neighborhood twice a day, if possible. And play with them as much as you can between walks. Get out in the yard and run around in the grass together. Playing fetch, hide-and-go-seek, or other games will make them incredibly happy. Also, be selective about which toys they play with. There are a lot of dog toys available that are made specifically to catch your dog’s attention for hours at a time. These toys are called puzzle toys and often offer food as a reward.  There are various ball puzzle toys to entertain your canine, that simply contain openings that release small treats when a treat aligns with that opening. All your dog has to do is nudge and paw the ball to move it around. There are even actual puzzles for dogs, that require certain parts to be moved or flipped to reveal a treat underneath. You can even switch out their toys, so they always have something new to play with. Make a handful available and put the rest away. Or, for a different challenge, hide your pup’s favorite toys so that they have a little scavenger hunt. Another option to consider if you can’t be with your dog all day, and they’re showing signs of boredom, is taking them to doggie daycare. Or, you could have a pet sitter come by three or four times a week. There are some instances where a dog will lick obsessively because they’re stressed about something.4 You need to be able to recognize when they’re stressed and address potential causes before the problem becomes chronic. 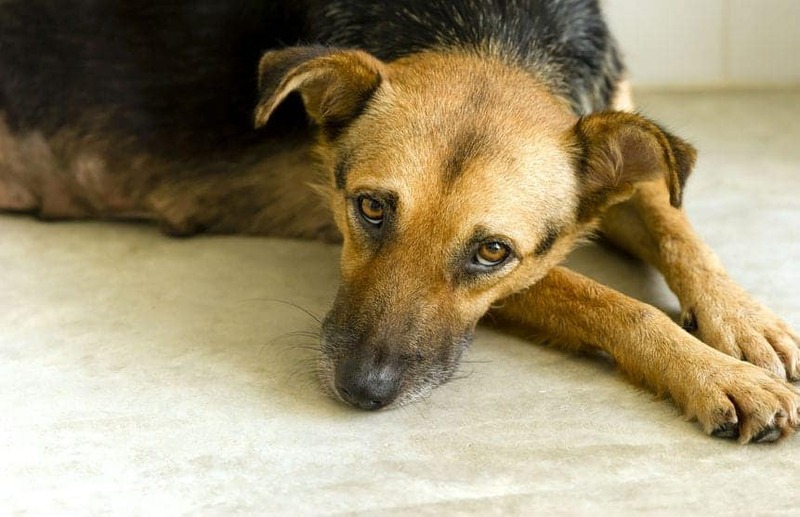 One of the most common reasons a dog will become stressed is housing relocation. If you’ve recently moved to a new home, try to make your pup’s surroundings as familiar as you can. Bring their old toys with you, and keep their old bed as well. That might help them adjust more easily to the new environment. If you’re still concerned that your dog is stressed, bring them to your veterinarian. Experienced vets know how to examine a dog to see why they might be exhibiting this type of stressful behavior. They also know exactly what can be done about it. There are a few things you can do to help stop your dog’s tendency to lick the floor or everything else they see. One of the most important is to be extremely careful when eating. Try not to let any crumbs fall to the floor, where your dog will be tempted to lick them up. You could also try giving your dog an alternative to licking the carpet. Try a toy stuffed with a treat, a puzzle toy, or even a popsicle specially made for dogs. Remember, if your dog licks the floor every once in awhile, that’s fine. It’s normal. You might have simply dropped a piece of food and they took care of it for you. But if they tend to lick day and night, that behavior could indicate some sort of health issue. Take them to your vet, so the problem can be addressed.